In 1950, the Swiss Army Technical Department made plans for a replacement of the pre-war lightweight "TL"-set still in use with some troops. In 1954, Zellweger Uster presented four prototypes of a 100W shortwave transceiver capable of single sideband and FSK transmission technology, they won the development contest and produced more then 550 units of this standard set until 1963. After WWII, there has been an increasing demand of voice communications and radioteletype for message transmission, this service should run with automatic encryption. 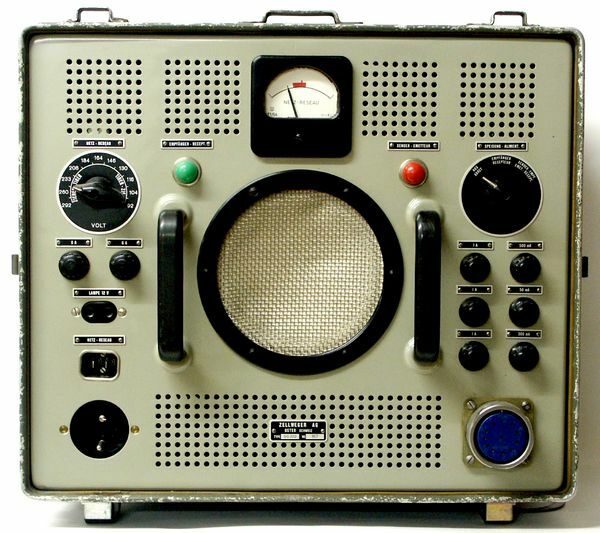 In the fifties, the Swiss army had to rely on pre-war shortwave sets and U.S. surplus VHF short range sets as the SCR-638 (two receivers BC-683-A and transmitter BC-684-A), carrying the SE-400 Swiss Army designation. Because of standard radioteletype transmissions using Baudot code was considered as unreliable, the Swiss Army relied on a system intented by Gretag: the ETK radioteletype machine could transmit 14 different segments of a character, so one or two missing bits or segments didn't make the character to be unreadible. These ETK teletype machines have could be used with the Swiss made ciphering machine Krypto-Funkfernschreiber 58 (radioteletype encryption system 58/68), an their signals could easily be transmitted via the SE-222 wireless sets. Mechanical frequency display with 500 Hz accuracy, 1,7 - 3,5 MHz. 5 m whip antenna on vehicle, 13 m antenna mast or 2 x 37 m dipole aerial. The wireless set SE-222 consists of two metal cases: one for the actual transceiver and the second with the power supply and speaker. Usually, the station has been mobile in a Volkswagen Bus, the operating staff could be transported in a second vehicle. The set could also be operated in a building, in a shelter and could be remotely controlled over 1,8 km of field telephone lines. The set's operating distance was 10 - 15 km using surface waves at daytime and much more at night using skywaves with ionospheric reflections. Usually, the set is mains powered, a wide range of operating voltages between 92 and 292V can be selected at the power supply front panel, the set's power consumption is 140W receiving and 455W while transmitting. There also has been the possibility to power the set from an electrical generator. On the front panel of the transceiver, You find in the left upper corner the large instrument displaying the signal strength, in the middle the station's clock (caution: the fingers are plated with radium containing colour and are missing quite often or usually, when the set has been shipped abroad), and the antenna current meter in the right upper corner. In the middle row, You find at Your left the controls for RF-gain (marked EMPF.SIGNAL) and AF gain (LAUTSTÄRKE - VOLUME). In the middle You find the frequency readout featuring mechanical digital display for the 100 kHz segments and a circular dial for the kHz, the frequency readout accuracy is usually better then 500 Hz. The frequencyy is tuned using the concentric tuning knobs. On the right hand, You find the antenna tuning controls, the correct settings are found on the lid covering the connectors on the right side of the set. On the right side of the transceiver, You find the connections for the field telephone line, the Morse key, the teletypewriter ETK and the power cable, on the right hand the antenna connector, the ventilator and the earth terminals. Two small round knobs are used to switch the right meter to different measurement positions to control different voltages and currents in the circuitry. The power supply can be set to a wide range of operation voltages, pull out the mains voltage selector switch to totate it, control the voltage setting with the meter, it should read in the red segment in the middle of the dial. When the set is set to reception mode, the green light will illuminate, the red one will come on when the set is set to transmit-receive mode. At the left of the bottom row of controls, You find a 12 V plug to connect a operator's lamp and a 220 V mains socket, You can power the teletypewriter from there. On the left side of the speaker, You find the mains fuses, on the right side the fuses for filament and plate / B+ current. There are a few more cases to go with the SE-222, an accessories kit with "Microtel" (the matching telephone-handset with the PTT button), key, the operator's lamp, spare tubes and cables for measuring and repair demands. in an additional box, You find all necessary bits for the antennas. The set ist found quite often at hamfests and is still popular to be used for ham communications in the 160 m bands.